The WAVE Foundation’s Board of Directors is pleased to announce another opportunity to earn scholarships this year for a college bound WAVE volunteer who intends to pursue studies about or relating to environmental science, marine biology, zoology or aquatics. The recipient will receive a one-time, nonrenewable scholarship in the amount of $1,000. There will be 3 ($1,000) scholarships given away this year to 3 deserving individuals. Applications will be accepted from April 25th through May 15th, 2018. The recipients of the WAVE Foundation Scholarship will be selected by members of the WAVE staff and Board of Directors. The recipient will be notified no later than May 30th, 2018. Applications and additional information may be picked up in the Volunteer Services Office or on our website: www.wavefoundation.org. Submissions MUST be a one-time submission with ALL required components included in one package. Applicant must be a citizen of the United States of America. Applicant must be a current or former WAVE Foundation volunteer. Applicant must be admitted to or already attending an accredited, four-year college or university. Applicant must have a record of academic achievement. Applicant must be committed to the pursuit of studies about or relating to marine science. The WAVE Foundation does not discriminate on the basis of age, race, color, national origin, disability, creed, or gender. Individuals must submit applications between April 25th through May 15th, 2018. The recipient of the WAVE Foundation Scholarship will be chosen by the Education Committee. The recipient will be contacted no later than May 15th, 2018. Submissions MUST be a one-time submission with ALL required components included in one package. Pinning my nametag on my uniform was the best feeling I ever had. 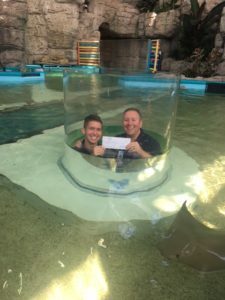 It meant I had been accepted as a WAVE Foundation volunteer at the Newport Aquarium, an organization dedicated to the conservation of marine life. It meant I could spend my days with countless sea creatures in diverse aquatic environments. It meant I could share my passion for the natural world with visitors to the Aquarium. 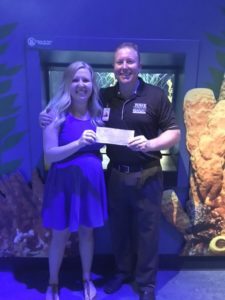 Since I started as a Newport Aquarium volunteer, my responsibilities have grown, and my roles in the organization have expanded. I now juggle four primary volunteer positions, including Day Captain, WAVE on Wheels Volunteer, Discovery Station Interpreter, and Exhibit Interpreter. Working in these various capacities has increased my passion for our environment and its inhabitants and has also developed critical communication skills, such as leadership, public speaking, and guest interaction. These meaningful opportunities have prepared me well as I begin my college career in environmental sciences at The University of North Carolina at Chapel Hill. Though I have had many amazing experiences through the WAVE Foundation, one event made an unforgettable impression on me. I woke up just after sunrise so I could arrive at the Aquarium early to prepare two small epaulette sharks for a long day of travel to a rural community in central Kentucky for a Community Outreach Program. My partners and I carefully filled up the portable tanks, made sure all the conditions were comfortable for our cartilaginous cargo, and then lugged the tanks and equipment to the van, ready to set off on our adventure. After a two-hour drive, we arrived at the Jessamine County Public Library. Before we even exited the van, we were greeted by inquisitive children curious about what we had to share with them. After setting up the tanks, my partner and I were ready. The doors ruptured like swollen floodgates with enthusiastic families eager to see and learn about aquatic life. The bright-eyed children grinned from ear to ear as we told them about each animal. They were spellbound as we mentioned fun facts about these fearsome predators and pointed out unique parts of the sharks’ anatomy. The end of our presentation was our grand finale, as each child had the opportunity to gently pet one of our sharks. The room exploded with excitement as the children waited their turn. My name is Joe Pedro, I am a senior at Ludlow High School, I have been a WAVE volunteer for four years, and have volunteered over 1,150 hours. 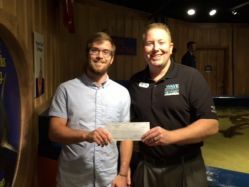 For as long as I can remember the Newport Aquarium has been a staple of my childhood, and I have always had a vested interest in the natural sciences. Naturally, when my mother asked me if I wanted to go to the WAVE foundation’s finstitute program during the summer of 2010 I lunged at the opportunity. I loved every minute of my three years at camp and made friends that I still talk to. Before I had hit the age limit for camp I knew the next step for my path in becoming a fledgling biologist was to start volunteering. Like my time at the finstitute, I would not trade my time as a Summer Naturalist for the world. 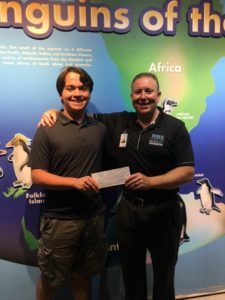 I enjoyed it so much that my first summer as a volunteer I worked over 400 hours, I stayed on throughout the school year as an exhibit interpreter and eventually applied for and was accepted into the Day Captain and Teen Apprenticeship programs. The aquarium not only satisfied my need to further my education in the sciences, it also nurtured in me a passion for the environment we live in and animals that we share the world with. I always tell my friends at school how the biologist I work under through the TAP program, took me to the aquarium’s offsite animal welfare facility, where the husbandry team had just gotten a shipment of frogs that had gone extinct in the wild. However, due to the implementation of a successful SSP (Species Survival Plan) the frogs were being kept from going completely extinct by a network of AZA zoos and aquariums that all had received shipments similar to the one we had received. I tell my friends, that you never really realize your place or effect on the world until you come into contact with another organism that has been affected by humans. I would never have truly developed an awareness like this if it were not for the aquarium. My growth as an individual through WAVE was not limited to my awareness of our natural world, the WAVE foundation also helped me develop my leadership skills and mature as I have grown older. During the summers of 2014 and 2015, I volunteered as a Day Captain. As a Day Captain I learned punctuality, responsibility, communication skills, critical thinking skills, and how to effectively work with a diverse and fast moving group of people. My skills and passions that I developed through WAVE also traversed to my high school career, where I currently participate in the Gateway Regional Academy, and serve as senior class and National Honors Society president. I also participated in Thomas More College’s dual credit Intro to Marine Biology class. Coincidentally, I plan to attend Thomas More College and major in General Biology with a minor in Chemistry. My name is Courtney Hall. I will be starting my Junior year at Wilmington College this Fall and I am majoring in Biology with Environmental Science. Since I was a small child I have had a love for all animals. This love for animals grew with me and I knew even at a young age that I wanted to work with animals. During my senior year of high school I was stuck between Marine Biology and Zoology, I chose Marine Biology, which I plan to do after I finish my degree at Wilmington College. The WAVE Foundation has guided me in the direction of not only working with animals, but educating people about the importance of preserving animals. 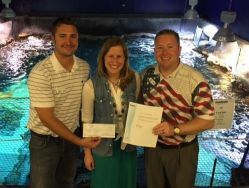 When I found out the Newport Aquarium had a volunteer program back in 2014, I was ecstatic! This is where I wanted to be. I was, and still am, striving to learn and educate people about these wonderful animals. In 2014 I started as a scared Summer Naturalist, but I have grown into someone who is not afraid to speak to others about the importance of conservation, and our mission at the WAVE Foundation. Being a Summer Naturalist made me comfortable with myself, and realize how much of a difference it made just to tell each person something they didn’t know before. Having the opportunity to be a Day Captain taught me responsibility, it made me a leader, I became a leader that I wanted the Summer Naturalist’s to look up to. While lately I have been focusing on the biology aspect of marine conservation, working with Laurel, the seahorse biologist; education with the outreach program is still very important to me. I don’t only want to care for marine animals, but every chance that I get, I want to teach people the importance of conserving animals, and what they can do to help. Helping Laurel has taught me how much work goes into being a biologist, but that this is still what I want to do, because in the end all the work is worth it. WAVE on Wheels has made me grow in many ways, in animal care, and my knowledge about each and every outreach animal. I love taking out the beautiful creatures, and making people see them through my eyes by telling everyone amazing things about the animal(s). During my senior year of high school, I decided to do the Gemini Program and take a Marine Biology class through Thomas More College. This hands on learning experience made me even more certain that this is what I wanted to do. Dr. Lorentz kept my attention throughout the whole class, and I still wanted to learn more, even after it was over. All of these amazing opportunities that the WAVE Foundation and the Newport Aquarium have provided me with has shaped me into the person that I am today. Every second of my 500+ hours has been an amazing, positive experience and I wouldn’t trade it for anything. I am very thankful for all of the great experiences I have had volunteering with the WAVE Foundation. My name is Teresa Urban. I am 17 years old, a Senior at St. Henry District Hight School, and I reside in Florence, KY. Since I was young I have been surrounded by people who are passionate about animals and conservation. Here in Northern Kentucky I realized quickly how the WAVE Foundation could make a large and lasting impact on my life. Sice I can remeber, the WAVE Foundation has provided me wiht an environment to learn about the earth and how to care of it though many different conservation efforts. When I was eight years old I began my involvement in programs supported by the WAVE Foundation. I enthusiastically participated in ‘Camp WAVE’ for a number of years where I experienced some of the best exposure to hands on science a kid could ask for. The Camp Wave programs have provided me with the building blocks for a careen in conservation and laid a foundation for my passion for learning more about environmental science. Camp Wave has also helped educate me about the aquarium, its animals, and the basics of animal science. When I was a little older, I became a camp mentor so I could share all that I have learned through the program myself iwth other future scientists. Most recently, I Have also been involved in multiple outreach events with the Wave Team such as school visits and charity events. What means the most to me is that the Wave Foundation has helped foster my passion for conservation and has helped me see how powerful educating the public can be. The opportunity to provide people wiht the correct information and anser questions about different outreach animals and about our environment around the tristate has helped me ralize how important eduction is in our commutniy. Being a part o fanimal outreach programs at Newport Aquarium has taught me how to effectively interact with all kinds of people and provide them wiht accurate facts. I want to be able to teach boht young minds and mature ones about how to take care of the environment and understand hwo precious and important our world is. I feel truly blessed with the opportunities this community has provided me. My favorite class at St. Henry is Environmental Science and I finished a college level Marine Biologyb class at Thomas More College when I was a junior. We had an incredible time learning on-site at the Aquarium. This summer I have accepted a work study position at the Thomas More College Biology Field Station. There I will be helping in the research of freshwater mussels and other endangered species in the Ohio River. I will also have teh change to be a mentor in a STEM camp there in July where I’ll be able to pass on the same enthusiams and guidance I recieved when attending the same camp last year. The people I have encountered over the eyars have inspired me to want to learn more. With this scholarship I will be able to continue my education immersed in active environmental programs and surrounded by inspirational people who, along with the Wave Foundation can help me begin to establish myself in a career with limitless opportunities for research and outerach. I have learned a great deal about the oceans during my more than 643 hours of volunteer work at the Newport Aquarium. 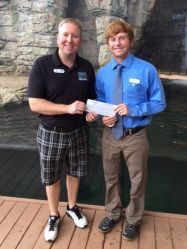 I began volunteering at the aquarium five years ago, at age 15, during the summer of my eighth-grade year. I understand the importance of saving our coral reefs, of reducing pollution in our oceans. The world is losing coral reefs due to pollution and warming seas. 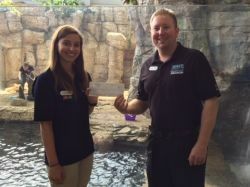 I learned that I love aquatic life through volunteering at the aquarium. Now, I am dedicated to the preservation of marine life. I spread the word to my friends and people I meet at the Newport Aquarium about the danger to our coral reefs with the knowledge I gained at the aquarium. I talk to people at the Aquarium. I encourage my friends to visit the Aquarium so that they can see the beauty of underwater life and learn about how to reduce pollution. I went on a scuba diving trip in July of 2015. We dove near the islands of Saba, Nevis, and St. Eustatius. I witnessed the beauty of the coral reefs and some of the damage they have suffered. I witnessed what pollution does to coral reefs. I also saw how artificial reefs are being made my sinking vessels. In order to try and create a new reef, countries would sink a boat intentionally so that coral can grow on the boat. The boats were amazingly massive, but were also rusting and our guide told us that it takes a very long time for new life to start forming. Some of the coral reefs that were more formed still looked like they were fighting to stay alive there was more rock than coral. It occurred to me that there has to be a better wat to create new coral reefs. This fall, I will attend the Florida Institute of Technology. I have been accepted into Florida Tech’s “Ocean Engineering” program. The money I would receive from this scholarship would go to the payment of my education. With this education, I will help find ways to reduce the pollution to our oceans, and come up with a better artificial coral reef that could be more productive in starting new life and new reefs. My name is Jonathan Frommeyer, and I will graduate from Conner High School on May 28, 2016. I will be attending Thomas More College in the fall and will be majoring in marine biology, environmental science, or both. My whole life I have always loved animals and their environments. Recycling and conservation have always been an area of interest for me. 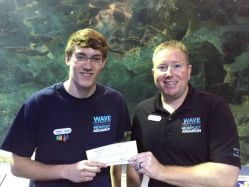 I have been a member of the Newport Aquarium since it opened in 1999, and I have been a volunteer for WAVE Foundation since 2011. My brother’s participation in the summer camp sparked my interest. I started volunteering for the WAVE Foundation summer camp when I was 13 years old and, at the end of the summer, transitioned into an exhibit interpreter. At camp, I teach kids about aquatic animals and the environments around them while also making sure they have fun learning. I also teach them about the importance of conversation. I feel it is important for them to learn because this keeps the animals and their environments healthy and safe. With this knowledge, they will be able to protect and preserve the environments around them and be able to teach other kids and their parents to do the same. My participation with Wave Foundation over the past five years has had a huge impact on my life. It has greatly improved my public speaking skills. Before I started at summer camp, I couldn’t even speak in front of a few people without being nervous, but after just one summer working with the kids, I became more comfortable and confident. I am now able to speak in front of just about anyone with ease. It has also impacted me by piquing my interest in environmental science and biology and helping me choose them as a major. This experience has allowed me to learn what I need to know to be successful and to be better prepared for either of those fields. I have learned a great deal about myself and what I am capable of doing as well. 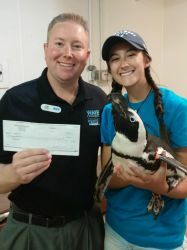 I know that, one day, I will be able to work at a great institution with any kinds of animals with the knowledge that I have gained through volunteering for the WAVE Foundation at Newport Aquarium. I will be forever grateful for my experiences at Newport Aquarium; they helped place me firmly on my life’s path. During two summers, I volunteered as a summer naturalist and eventually as a dive intern. Inspired by lessons learned at Newport Aquarium and thanks to the confidence I acquired through my time there, I went on to become a lecturer for Oceans for Youth. I also served as an environmental educator on board The Clearwater Hudson River Sloop where I taught experiential lessons while living onboard. Sponsored by the Smithsonian Institute and National Geographic, I was designated a National Youth Delegate from Kentucky to the Washington Youth Summit on the Environment. Recently I was named a Clinton Global Initiatives Scholar in the area of environment. Just like I first learned at Newport Aquarium, in all these encounters, I witnessed the importance of involving youth and community in environmental volunteerism, awareness and protection. I’m studying to become a marine conservation biologist, a discipline that is critical in today’s world due to an ever expanding human population. As a conservation biologist I’ll address the immediate issue of the accelerating number of endangered marine species resulting from reckless human activity and habitat loss. By doing so, I will confront the larger issue of how human impact and climate change negatively affect the biological diversity of the oceans. I am an Honors Scholar and Jones Research Scholar in my junior year at the University of Louisville studying Environmental Analysis and Conservation Biology. I have studied multiple aspects of the environment including hydrology, geoscience and climatology. Currently I am attending New College of Florida on a full transfer scholarship to obtain a concentration in Marine Biology. This will provide me with a knowledge base to address both the biological and climate aspects of marine conservation biology. In 2015, I was selected as the Etscorn International Summer Research Scholarship recipient. The scholarship fully funded a summer long internship for me where I served as a research diver in the Yucatan Peninsula. Working with professors from the Universidad Nacional Autónoma de Mexico and scientists from Spotted Drum Expeditions, I studied anthropogenic effects on cenotes and the biodiversity of artificial reefs. I gained critical marine field work experience as well as skills for diving, researching and photographing in underwater karst and reef environments. In 2016, I was selected for fellowship in Germany through the Congress-Bundestag Youth Exchange for Young Professionals program which is sponsored by Fulbright-Hays. I will study, intern and research with German environmentalists and marine biologists for a year. As a scuba diver for over half my lifetime, I’ve logged over 500 dives in a variety of conditions and countries. My certifications in Divemaster and Rescue Diver along with my extensive bottom time have given me a unique skill set and a confidence underwater that education combined with experience produces. Along with this, I credit my volunteer work at the Newport Aquarium as one of the pivotal experiences that placed me on my life’s path. Volunteering at the aquarium has made a huge impact on my life. It’s affected everything- my classes at school, my college major, my communication and leadership skills, and even my confidence level. As a Summer Naturalist, I learned how to be a better communicator. I can now walk up to a stranger and feel completely comfortable starting and carrying on a conversation. I became more confident in myself, as I realized that interacting with people is something that I am skilled at. Through the Summer Naturalist and Exhibit Interpreter positions, my passion for marine inhabitants grew immensely. Before, I had always thought that working with them would be just an interesting hobby. But during my first year as a volunteer, I realized that working with marine animals was truly something I wanted to pursue as a career. Volunteering gave me a voice to educate others, both inside and outside of the aquarium. When I was promoted to a Day Captain, my leadership skills were strengthened. I learned a lot about how to critique, motivate, and support those whom I was responsible for. Now as a Wave on Wheels volunteer, I have the ability to share my passion with people outside of the aquarium. I am now able to serve the community with the knowledge that I’ve gained through the Wave Foundation. When planning out my senior year, I knew I wanted to challenge myself and take AP Environmental Science and AP Biology. Because of my background with the aquarium, I was so excited to take classes that actually interested me and allowed me to learn even more about our ecosystems, both marine and terrestrial. Those were by far my two favorite classes in all of high school, and there’s no way I would have considered taking them if I hadn’t started volunteering. Those classes as well as my volunteer positions highly influenced my decision to major in biology at the University of South Carolina. I know I picked the right school for me because the Biology degree has an emphasis in marine biology, and the campus is only a short 5 minutes from the Riverbank’s Zoo. There’s no place that will ever feel quite like home to me as the Newport Aquarium, but I am hoping to continue volunteering with marine animals at the Riverbanks Zoo sometime during my next four years at USC. One of my favorite moments as a volunteer is seeing a child’s face light up when they first interact with an animal, whether it’s by touching a shark or seeing an otter dive into the water. I want to conserve our oceans and animals, so that one day their children can have the same experiences that they did. The WAVE scholarship would help me pursue my passion and further my education in the marine biology world, so that I can advance to graduate school and one day have a career doing exactly what I love – working with marine animals and protecting our ecosystems.